From the acclaimed author of STILL MISSING comes a psychological thriller about one woman’s search into her past and the deadly truth she uncovers. All her life, Sara Gallagher has wondered about her birth parents. As an adopted child with two sisters who were born naturally to her parents, Sara’s home life was not ideal. The question of why she was given up for adoption has always haunted her. Finally, she is ready to take steps and find closure. Can you say WOW? This is another home run from author Chevy Stevens. I was so excited to see this book had been released because I LOVED Still Missing , which was this authors debut book. Although I didn’t quite love this book as much as her first, it still was very good. The characters were well written, they were flawed just like real people. Sara was a mix of personalities. She was impulsive, confused, moody and deceptive. Her daughter was a bit of a brat, throwing a hissy fit when she didn’t get her way. Evan was a bit overbearing at times, wanting Sara to do what he wanted her to do. Most of the time characters like that tend to get on my nerves, but in this book, with what was going on, I liked them. It added so much emotion to the story. The only down side of the book was that it was a little slow at the beginning. But once it picked up speed, it was a white knuckle ride. AND, the ending was amazing! I know there are lots of reviews out there that don’t sing the praises of this book, but don’t let that influence you. Not everyone will like the same books. Get a copy, read it, and make up your own mind. I haven't tried Stevens' work yet, but I really want to – I think I'd love these books. 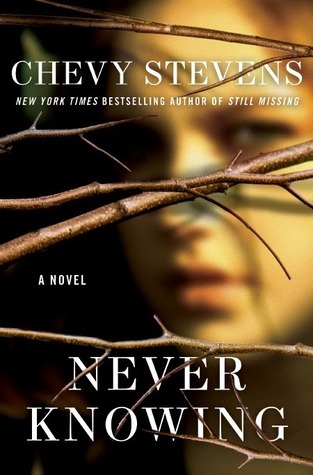 I'm another Stevens fan – I loved Still Missing and gave it a 5-star review on my blog. I've heard that fans of her first book will not be disappointed with this one. Can't wait to read it! OLD FOLLOWER…just stopping by to take a look around. I havent read any of Chevy's books but am adding her to my new author list. I love mystery, suspense, intrigue and sitting on the edge of my seat stories. Thanks for this opportunity to enter giveaway hop. I agree … it wasn't as good as Still Missing but I was still flipping pages and needing to know what happened! I agree with you. It was good, a little slow at times, but good. I think Still Missing was a bit better, don't you?